SPRING IS HERE!!! And so are ORIOLES! These wild birds are strikingly beautiful! Because of their beautiful black, orange or yellow color, their distinctive whistle, spring songs, and their amazing suspended nests, which we'll plan to look at further. ORIOLES are quickly becoming one of America's favorite wild birds. 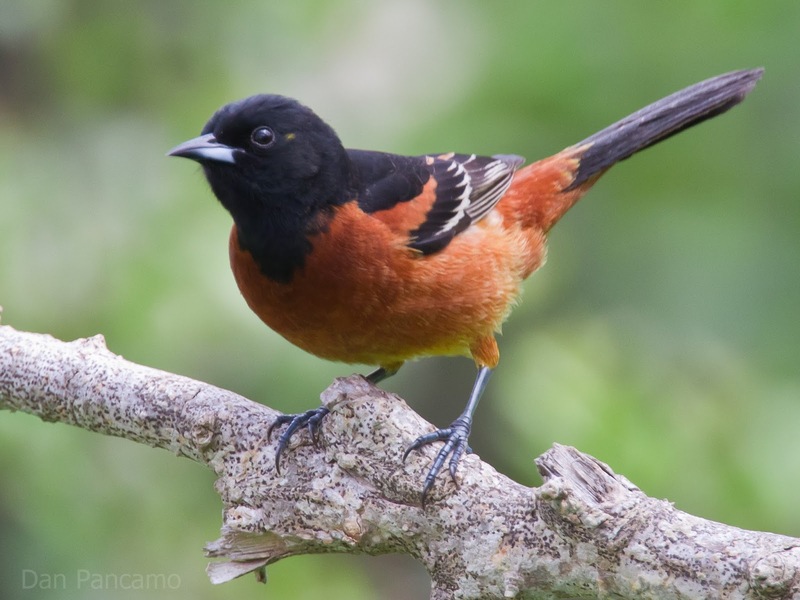 While over eight species of Orioles can regularly be seen in the United States, we want to look at the "Major Three" species - Baltimore, Bullocks, and Orchard. ALL United States Orioles show variation on the theme of black with yellow or orange color. Except for in the Southeast, all Orioles are tropical migrant wild birds. While migrations vary, Orioles generally arrive in the South in early spring, mid-west in early May, and further North soon afterward. It is very important, for one that is interested in housing and feeding, that Oriole feeders up and ready around May 1st, or often Orioles will pass you by for better feeding grounds. It is also important to have nesting materials out and ready to help attract and encourage Orioles to nest in your yard because by summer's end, migrating Orioles are headed back south to their tropical winter homes in Central and South America. It seems that Baltimore Orioles (Not the Major League Baseball Team) ranges are expanding, while Bullocks and Orchard Orioles are declining. ALL Orioles need and benefit from our help and we benefit from them also where natural pollination and insect control is concerned. We can help by setting up bird feeders, bird food, bird bath's and bird seed in your neck of the woods and be a part of the bird feed and housing shortages. Where nesting material is available, Orioles will defend an area of several acres and start building a pendulous (hanging loosely) nest. Here are some interesting facts and ideas to think about, when planning to set out bird food in your yard, near your bird bath and to fill your bird feeders to feed and attract these wild bird Orioles. Here are some facts to keep in mind about Orioles. ORIOLES migrate at night so they are tired, cold and hungry when they arrive in your neck of the woods. If you wait until you see them, you are "too late" to attract Orioles, in maximum numbers, to your yard. Not so much wild bird seed but bird food like ORANGES is one of the "keys" to attracting Orioles. Cut oranges in half and provide them "juicy side out" for a refreshing snack for these beautiful birds. You can also attract these wild birds up close by offering Oriole feeder nectar, jelly, and fruit on the feeders by the house and patio. They love the bright orange feeders and they are inexpensive and slip right on any Smuckers (tm) or other 10-12 ounce jelly jars. Hanging the nests on a multi-level, wrought iron hanger is another idea, as you are able to tier multiple nests for their room and board enjoyments. Many people feed jelly year-around, not only Orioles but Woodpeckers, Robins, Warblers, and others enjoy it. Many people have said that they keep Orioles longer now that they feed grape jelly!!!! There are a lot of people who claim that their favorite Oriole nectar feeders are Oriole Feeders. Why? Their wide mouths and flat tops, make them easy to fill and clean (base also comes apart easily to clean), and some have bee guards to make sure that Orioles - not bees - enjoy the nectar. If you're worried about ants bothering your jelly or Oriole nectar, there are guards to put on and hang Oriole feeders with clear nectar protector ant moats above them and fill with water. This acts like a moat, similar to those around the old castles and has a similar effect. As you are probably well aware, ants can't swim, and for a few extra dollars, you'll never have to mess with cleaning them out of the feeder. These also work well with hummingbird feeders. While it is often advised that it is good to mix their own humming bird nectar from sugar, some opinion is that commercial Oriole nectar will attract and hold more Orioles and other wild birds at the feeder longer. What ever you decide to set up, there are two things to keep in mind. Creativity and fun! You and your family will really enjoy these colors of nature occupying a place in your neck of the woods. Not to mention, you are helping them in their survival and keeping a good, natural source of insect control and pollinators around. Best wishes to you and your endeavors with the Orioles of North America!